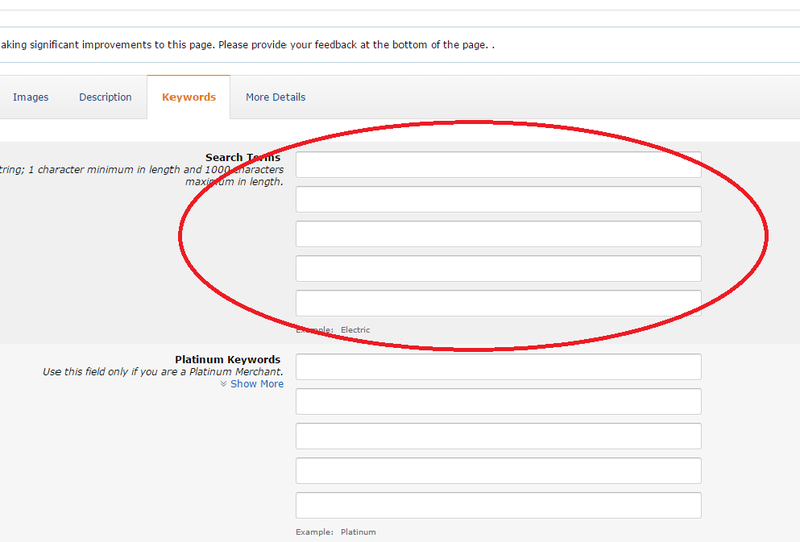 Amazon recently updated Search Terms fields and allowed larger number of characters. I want to hear your opinion as to a consensus on how this works. I understood that a) is the way to go from many sources... and it seems to be working and also allowing sellers to fit more relevant search terms, but I continue to hear from Sellers ever so often that in fact b) brings in results (this unconfirmed, just opinions). With the largely expanded size of search terms fields, I wonder if anyone has a definitive answer to back this up with something solid, like an article by Amazon or a study by a reputable source? This is important as this is a free way to boost listing traffic and sales. @Travis_Jamison ? @Sammy ? AMZ Tracker team? Thank you for contacting Amazon Seller Support. I certainly understand that you are concerned about the search terms in the manage inventory page and in the feed file. Kindly allow me to assist you with your concern. Kindly note that as per the updated the the number of column to update the keywords has been reduced to one column however you can use multiple keywords separated by commas in the template limited up to 50 characters. Also kindly be assured that the the 4 fields for keywords in the manage inventory files are valid and will certainly function and you can continue using this feature. 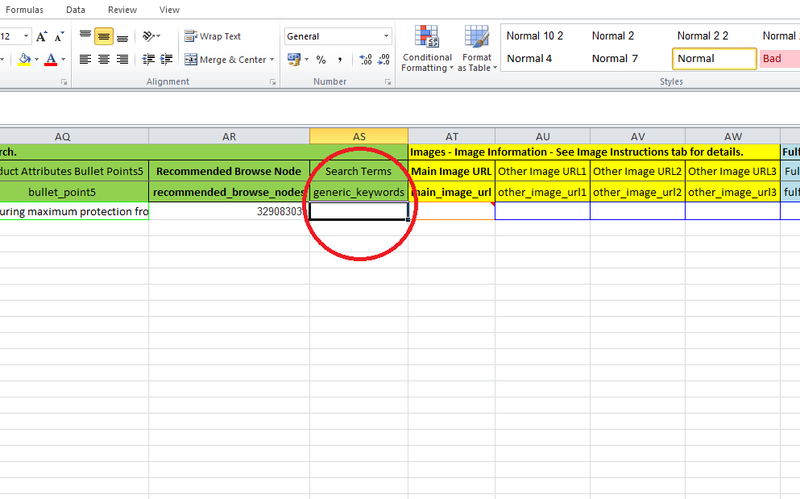 Therefore you can use multiple keywords in the same column limited to 50 charterers and I certainly understand that this is a limited option and i have passed this to our business team as this is one of the useful tabs. We will certainly inform you as soon as this feature is implemented. My sincere apologies for any inconvenience caused to you in this regard. I really wish I could help you further with this feature however we work for seller support and have limited access to these decision however I have forwarded this to our business team as mentioned previously. My concern with support emails coming from Amazon staff located in India is that due to Amazon's structure, many are uniformed or misinformed about many technical aspects of the business... This is largely deliberate... I can see how the lower-paid staff is often used as a filter to keep Sellers away from more specialized staff... This is nothing against people from India - I work on many projects with developers and marketing specialists from India and they do a great job... But when I read this email, I do not feel confident that the person who responded to you had the correct knowledge as to how the fields work... especially the "separated by coma" part. We were told the opposite by support, that option A is the way to go. But my gut tells me it is B, simply because there are WAY to many options with A in light of the sheer volume of characters now allowed. I also think there is still much more weight given to the title and bullet points. Many of the keywords we tried that weren't in the listing itself aren't ranking at all. @constantine did you ever find out more about this by chance? All I know is the old system of "no commas or repeating words", but I have zero verification on the new system from anyone. Right guys. Here is some little updates after emailing ACS and testing. I know it's again the rules but I created few very similar listings for the same product but played with keywords in different ways and tracked them by the same keywords. Ranking is always jumping up and down. The one thing I would suggest - Need to pay more attention to the Title and Bullet points. Yes @Abe was right - keywords aren't in the listing not ranking at all for some reason. Repeating keywords in search term won't work. Commas not working nor exact match o_O. Also I was happy enough to speak with Chris instead of "uniformed or misinformed about many technical aspects of the business" as @constantine said above. I read most of this information before but it's great to have this information handy. Kind and warmest greetings from the Amazon Seller Support team. My name is Chris. Firstly, I would like to say that it has been an absolute pleasure assisting you today and I would like to thank you for your time and kind consideration. I understand that your enquiry is regarding search terms. Please note that Amazon provides sellers with an opportunity to include additional product-related keywords in fields such as search terms, subject keywords, style keywords etc. These keywords should only include relevant information that is not already captured by other fields such as product name, key product features, product description, brand name etc. If a keyword provides the customer valuable information about your product, then it belongs in product description or key product features (bullet points). For e.g. for an all-in-one printer, it is better to include “scanner” and “copier” terms in the bullet points rather than as search terms in keyword fields. You are not required to provide keywords for your product. Also, there is no additional benefit in providing keywords except when they contain unique information such as alternate names, abbreviations etc. that doesn’t fit in any other non-keyword field. 1. Don’t provide inaccurate, misleading, or irrelevant information such as competitor product, brand or author name, wrong gender etc. Providing misleading or irrelevant information is against Amazon policy; your listing will be removed and your account will be suspended . Moreover, your product might end up in a wrong browse node and your sales might get affected. 2. Don’t provide excessively long content. Providing overly long content can violate Amazon selling platform policy. For more information, please see Prohibited Seller Activities and Action. Respect the limits that are set for different fields. 3. Don’t provide redundant information that is already captured in other fields such as title, author, product description, bullet points, brand etc. It won’t improve your product placement in search results. 4. When entering several words as a search term, put them in the most logical order. A customer is more likely to search for big stuffed teddy bears than for teddy stuffed bears. 5. Use a single space to separate keywords. No commas, semicolons, carets are required. 6. Don’t include statements that are only temporarily true, e.g., “new,” “on sale,” “available now”. 7. Don’t include subjective claims such as amazing, good quality etc. as most customers don’t use subjective terms in their queries. 8. Don’t include common misspellings of the product name. Amazon's search engine compensates for common customer misspellings and also offers corrective suggestions. 9. Don’t provide variants of spacing, punctuation, capitalisation, and pluralisation (“80GB” and “80 GB”, “computer” and “computers”, etc.). Our search engine automatically includes different case forms, word forms and spelling variants for searching. 10. Don’t include terms that are abusive or offensive in nature. 11. Abbreviations, alternate names, topic (for books etc. ), and key character (for books, movies etc.) could be included as keywords. @artweb : that's the most helpful post I have seen in a while... Thank you!